(Minneapolis, MN) April 18, 2018 — Northern Lights.mn announces the complete line-up of 26 artist projects for its free, eighth annual Northern Spark festival illuminating public spaces in downtown Minneapolis, featuring this year’s Creative City Challenge Winner, Carry on Homes. What do we share when we gather together in physical space? 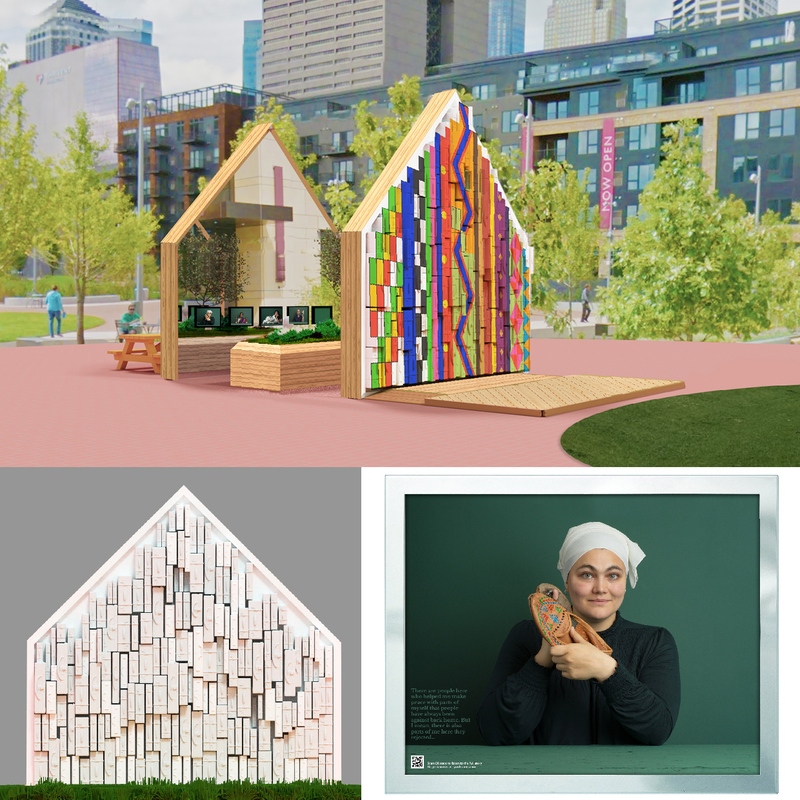 Artists will explore the theme Commonality through a diverse range of vibrant and thought-provoking projects located in The Commons, the Minneapolis Central Library, and along Nicollet between 4th and 8th Streets. This year’s Northern Spark features two nights of art and connection with community—Friday, June 15 and Saturday, June 16—starting at dusk (9:02 pm) and ending at 2 am. The complete list of project descriptions is available at 2018.northernspark.org/art-and-events. Northern Spark kicks off at dusk on June 15 in The Commons with the premiere of the 2018 Creative City Challenge winner, Carry On Homes. Carry On Homes is a multi-functional pavilion hosting the stories of immigrants in Minnesota, where individuals come together to explore the concept of home through community gatherings, workshops, live performances and personal reflection. Home is a universal idea that transcends divisions by race, religion, gender identity, and class. At home, we belong, we feel safe and we are loved. Join us at The Commons, as we celebrate the immigrant cultures from around the world that have come to call Minnesota home. Conceived by five artists from five countries and stemming from the Carry On Homes documentary photography project, this interactive sculptural installation reimagines the home as an open structure. Walls disappear, while invitations to engage appear in the multiple forms of a stage, a colorful mural, a reflecting garden, a photo gallery and a sculpture built from repurposed suitcases. This experience is free and open to everyone, everyday, beginning June 15, 2018 and lasting throughout the summer. Funktavism (fun activism) is the Smart Wars strategy designed to include all people in the reawakening of indigenous ancestry on planet earth. Through our shared indigenous reality we create a future for true life to thrive with sparkling pure water, abundant earth for all species, and a happily generous disposition among people. The audience is invited to join a Round Dance with the performers. Meme Weaver is a human scale, interactive hand operated-robot assisted loom that weaves poems. Computer controlled and people powered, Meme Weaver explores human-machine collaboration, textile manufacture, consumerism, factory life and arcade games. The loom explores human-machine collaboration by employing volunteers to carry out the computer plan. The small and laborious output from this loom attempts to refocus on the effort and resources that weaving require. Inspired by the 1870 historic photograph of thousands of buffalo skulls near Fort Sill, this project emphasizes the idea of a shared space on this continent, Turtle Island, otherwise known as North America. A collaboration between lead artist Keith Braveheart and NACDI, A Buffalo Nation responds to the common and ongoing threats to our environment and cultures. Native youth from the Oscar Howe Summer Art Institute in South Dakota will assist Braveheart in running a screen-print and origami assembly line to produce hundreds of buffalo figures. The public will participate in screen-printing, folding, and customizing their own buffalo. Each piece will then be added to a collaborative and growing sculpture meant to invoke the 1870 photograph, one that depicts the moment in American history wherein settlers slaughtered bison to near extinction. The resulting installation from the two nights of Northern Spark will then be displayed during the Indigenous Peoples’ Day Festival 2018 in the American Indian Cultural Corridor in Minneapolis. In a time when anti-immigration sentiments are at an all-time high, this project captures the different journeys made by immigrants and refugees to America. Festival goers are invited to paint the flag of their homeland and add it to a collective canvas, to represent immigration to Minnesota from all continents of the globe. Binyam Raba’s paintings capture immigration journeys, and highlight the different positive contributions that immigrants and their communities have made to American society. Through our partnership with African Economic Development Solutions (AEDS), this project will be re-presented at AEDS’ Little Africa Fest in August 2018. Black and brown bodies are the most heavily surveilled persons on the planet. Through the Glass Eyes dissects the current state of extreme government surveillance within our communities, specifically in North Minneapolis. Looking at the strategic placement of CCTV cameras surrounding our environments, and the effect it has on our people, artist Chango Cummings looks to debunk the stigmas created and project true narratives of the Black community, using multifaceted performance, live sculpture creation, and mural. A genuine compliment can boost energy, mood, and self-esteem for several days. What could a shower of compliments do? Enter The Applause Posse, a performing duo using voice, guitar, other portable instruments for the sole purpose of showering people with musical compliments on Nicollet Mall at Northern Spark. Representing over 200 years of immigration to Minnesota and the United States, this large-scale architectural video projection will illuminate the City Center building at 6th Street and Nicollet, the first commercial district in Minneapolis. Overlaying historic photographs, found film, and animated data from the Department of Homeland Security’s Office of Immigration Statistics, this work presents the commonalities that many Americans have in ancestral migration, celebrates the significant cultural and economic impact of immigration in Minnesota and the United States, and analyzes how consumer motion picture film became a means to perform and project broader American ideals. This multimedia experience seeks to create a link between the technological and biological, the physical and the metaphysical, linking the inner rhythms of light with the outer pace of our busy surroundings. This installation is inspired by the principles of “golden ratio” geometric patterns of light and sound effects on our collective healing by creating a sacred space of positive intention and commonality. The Night Library returns to Northern Spark, for the 4th year, this time in Minneapolis Central Library! Explore the dark stacks of The Night Library to unlock hidden narratives and bring untold stories to life. Hennepin County Library staff and artists explore the role of information and the library in society through an interactive collaborative narrative with puzzles, games, humor, and light. Withdraw what you need from this free-standing teller’s booth. Currency takes the form of notes of encouraging and affirmation. The Empathy Economy is an ongoing project examining systems of exchange, questioning our notions of value, inclusion, wealth, and generosity. Empathy Mutual operates on the values of human connection and persistent optimism, and has the power to transformation systems of inequity through personal interaction and small acts of kindness. Common Urban Edible Plants native to Minneapolis grow all over downtown, including the ground that the Hennepin County Library rests upon. Paige Dansinger, artist-in-residence for the Spencer Collection in the Minneapolis Athenaeum and founding director of the Better World Museum, invites members of the Best Buy Teen Tech Lab to join her in drawing common urban edible plants in digital and virtual reality. Regaining traditional edible and medicinal knowledge while using new creative technology helps make 17-19th century botanical prints relevant to today’s young audiences. FALLS is a dance performance that cheerfully re-contextualizes the physical interactions that meet us in moments of illness or trauma. Anna Marie Shogren uses the language of contact in care facilities to send individual audience members on a ride, through the chain reaction of assisted falls, ambulations, lifts, and transfers spanning the length of the Minneapolis Central Library hallway. Read and check out books banned from American prisons! Prison environments suppress the diversity of all it can control – which is eventually, nearly everything beyond the body. Whatever inmates have or used to have in common with each other in the outside world is stripped off to prison routine. Little illustrates this imposed commonality better than a bookshelf with publications having little in common except being subjected to an opaque and arbitrary process of prison censorship. A zine is a handmade or online publication that is created using any media of art. Zines are known for being an accessible art form that promotes and brings community together. This workshop hosted by trans artists will allow participants the opportunity to create their own zine with instructions and hands-on help with an emphasis on trans inclusivity and community. This performance is part of a radical experiment that seeks to test, redefine, and innovate the use of space, performative technique, and the role of the audience. Tolansu Dansu is a multi-layered interactive dance space for social change inspired by Japanese bon dance, designed by Akiko Ostlund. We’re excited to announce the artists whose amazing work will light up Minneapolis this June! Artists were selected through an open call and include: Kashimana Ahua, Maddy Bartsch, Keith BraveHeart, Laura Brown, Tiffany Carbonneau, Carry On Homes family (Peng Wu, Shun Jie Yong, Aki Shibata, Preston Drum, and Zoe Cinel), Catalyst Artists (Akiko Ostlund, Shá Cage, and Alejandro Eduarte), Daniel McCarthy Clifford, Chango Cummings, Paige Dansinger, Danielle Everine and David Heisserer, Foci Focus Group (Chad Holliday, Kelly Nezworski, Ellie Gagner, Jon Rees), Adja Gildersleve, Jaden Hansen and Hector Chavarria, artists of the Minneapolis Art Lending Library (MALL), Minnesota Sacred Harp Singers, Night Librarians (Rhiana Yazzie, Tony Biele, Jon Cole), Sami Pfeffer, Binyam Raba, Matthew Ramirez and Breezy Callens, Anna Marie Shogren, Miko S. Simmons, Chase Underwood and Zeam Porter, and Wakemup Productions (Rory Wakemup, Liseli Povlika, Laverne Good Thunder, Mary Erler Peters, Isaac Larsen, KJ Blue, Mat Pendleton, Elle Thoni, The Sampson Bros, Red Tree Singers, Puppet Master Mark). Learn more about all of our artist projects at 2018.northernspark.org/art-and-events. Northern Spark has always been a collaborative effort. Northern Lights.mn is excited to be working with several organizations on the programming of Northern Spark 2018: African Economic Development Solutions (AEDS), Catalyst Arts, The Cycling Museum of Minnesota, FOCI Minnesota Center for Glass Art, Hennepin County Library, MN Artists, Minnesota Sacred Harp Singers, Minneapolis Lending Library (MALL), Museum of Minneapolis, Native American Community Development Initiatives (NACDI), Save the Boundary Waters, Weaver’s Guild of Minnesota, and Weisman Art Museum. And we are extremely grateful for the collaboration and support of our Venue Partners: Green Minneapolis and The Commons, Hennepin County Library, and Minneapolis Downtown Improvement District. Learn more about the work of our Programming and Venue partners at 2018.northernspark.org/festival-partners/partners. The theme of this year’s festival takes its cue from its venues: The Commons, the Minneapolis Central Library, and Nicollet. What is a 21st century commons? A 21st century library that serves everyone? A pedestrian avenue that is open to anyone? At a time when the darkest parts of our collective identity surface daily in public forms — overt racism, everyday sexism, challenges to our rights to free speech, policies that fly in the face of climate science — Northern Lights.mn is committed to providing platforms that resist discriminatory ideas, open dialogue and create relationships. What do we have in common? In the context of Northern Spark, what do we share when we gather together in physical space? Programming and art will be the same each night unless otherwise noted. Nicollet, between 4th St. and 8th St.
Saturday, June 16, 7 – 10 pm: Art on the Rooftop: A Party to Benefit Northern Spark, The rooftop lounge at Le Meridien Chambers Hotel, 901 Hennepin Ave. Since 2011 thousands of Minnesotans and visitors have enjoyed Northern Spark, an annual arts festival illuminating public spaces in Minneapolis and St. Paul. In early June, tens of thousands of people gather to explore giant video projections, play in temporary installations in the streets, and enjoy experimental performances in green spaces. Late into the night the city surprises you: friendly crowds, glowing groups of cyclists, an unexpected path through the urban landscape, the magic of sunrise after a night of amazing art and experiences. Northern Spark is known as a dusk-to-dawn event. In 2018 we are experimenting with a two-night model for attendees to experience the artful magic of Northern Spark for two nights in a row until 2 am. Memorable projects from past Northern Spark festivals include Chris Larson’s Celebration/Love/Loss, Jim Campbell’s Scattered Light, Luke Savisky’s Ex-MN, Pramila Vasudevan’s Census, and countless other projects from artists such as: Ananya Dance Theater, Marina Zurkow, HOTTEA, and Million Artist Movement. Northern Spark is produced by Northern Lights.mn, a Twin Cities non-profit arts organization whose work ranges from large-scale public art platforms like Northern Spark to Art(ists) On the Verge, a year­long mentorship program for 5 emerging artists working with digital culture. We support artists in the creation and presentation of art in the public sphere, such as at St. Paul’s Union Depot (Amateur Intelligence Radio), “choir karaoke” at the Minnesota State Fair (Giant Sing Along) and most recently Illuminate South Loop, a mini outdoor festival of nine interactive projects in Bloomington, MN’s South Loop in the days leading up to the Super Bowl. Through projects such as Ruination: City of Dust, a location-­based environmental mystery game, and large scale festivals themed around social issues, our work helps audiences explore expanded possibilities for civic engagement through art. Please click here for more info about our Northern Spark 2018 Funders & Sponsors.